How many of you have older kids that cannot tie their shoes? Me. Yep, my 7 year old cannot tie his shoes. My older child learned later on too. Kids today don’t have shoes with ties, it’s all velcro and slip ons and it’s sad. Shoe tying is a developmental milestone that seems to have gone out the window. 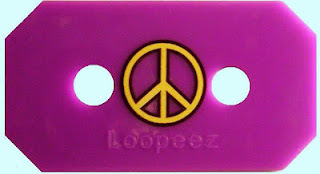 Today the Chesco On The Cheap Review Team had the chance to try out Loopeez. Loopeez are rubber shoe tying aids that accelerate the learning process by taking the frustration out of learning how to tie your shoes and making it fun. Loopeez keep shoes tied longer and come in cool colors and designs that your child will love. These shoe tying aids have lots of grip and are recommended for kids 4 yrs of age and up. So what did my frustrated with tying his shoes 7 year old think about Loopeez? Not too much at first. I demonstrated and we worked on it. Loopeez made it less confusing for him. The two “rabbit ears” stayed put and the other laces were underneath the Loopeez, making him focus on just the bunny ears, making an x, etc.. He’s still working on it but has a much better understanding and he’s on the verge of getting it thanks to Loopeez! Then he ran to show his sister that he could tie his shoes. She LOVED the idea and wants Loopeez for her shoes “just because they look cool!” What Mom Thinks: Loopeez are a great idea! I was worried about my 7 year old getting teased for wearing these. Instead his friends love them and think they are part of his shoe and would like a pair for themselves! Loopeez are also perfect for kids who receive Occupational Therapy and for Rehabilitation patients. The Loopeez Company also makes some rad looking bi-color shoelaces to help figure out where each loop goes. My kids haven’t seen these laces but I’m sure they would want a pair. Here we have a product that builds independence, increases confidence and scores high fashion points with kids. Thank you Loopeez! Loopeez are affordable, $7.95 (for two) and come in all sorts of neat designs. Loopeez has agreed to give one lucky Chesco On The Cheap reader one FREE pair of Boys or Girls Camo Loopeez. Enter the rafflecopter below for your chance to win! Make sure to thank Courtney at Loopeez for this wonderful giveaway. Disclosure: I have received one or more of the products listed above in order to facilitate an honest review. All opinions are my own.